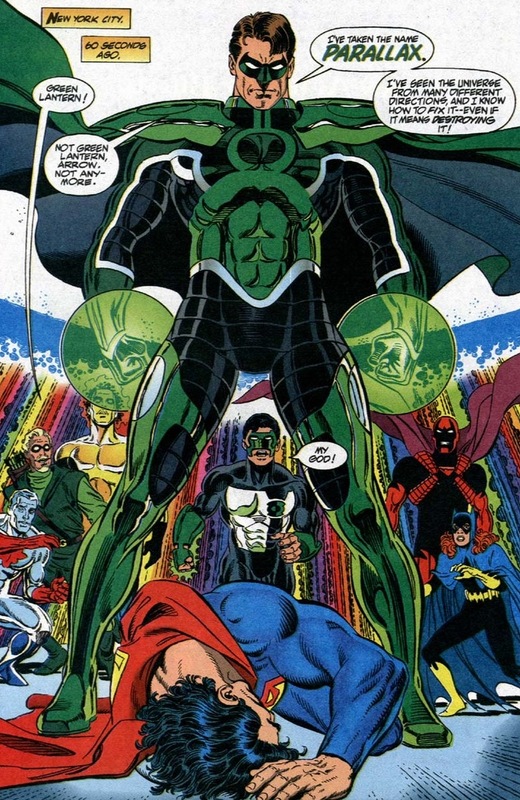 Hey, remember when Green Lantern Hal Jordan went crazy after his hometown blew up, became a wildly powerful bad guy, murdered a whole bunch of superheroes, wiped out the entire Green Lantern Corps, and then died? No? Well, Batman remembers. Batman always remembers. Though Jordan did get a cool supervillain costume. 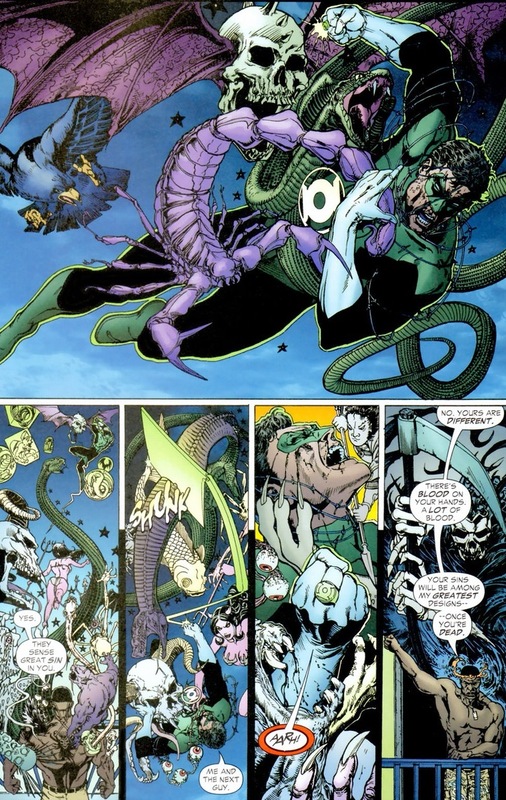 As you just read, in the 1990s, a cosmic force called Parallax possessed Jordan and forced him to do all those evil actions (after the retcon, anyway). Well, in 2005, he came back to life. And in usual Hal Jordan fashion, he does not have the time — gosh darn it — to explain miracles like his return to both life and superheroism. 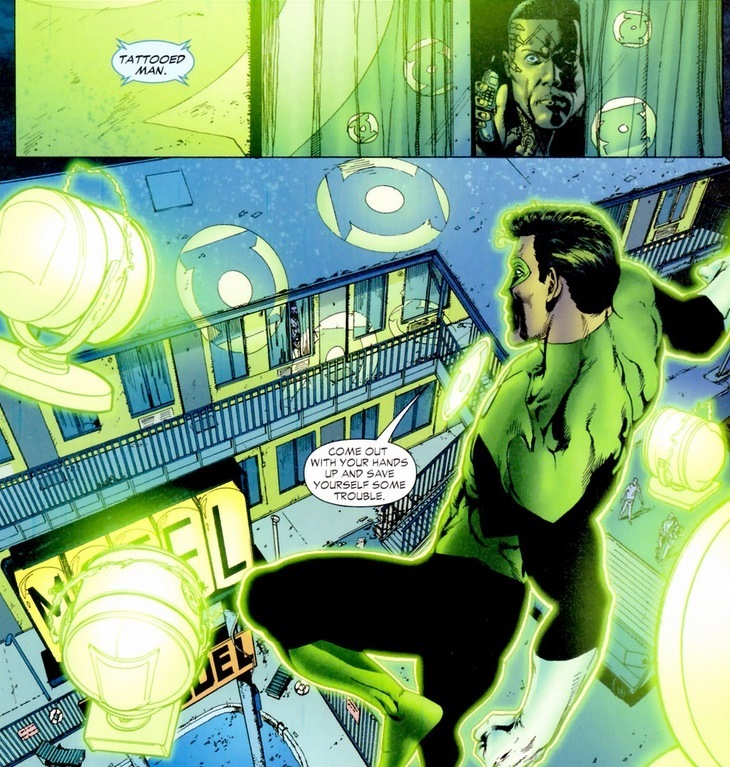 Such as in this scene from Green Lantern: Rebirth #6, written by Geoff Johns and drawn by Ethan Van Sciver. 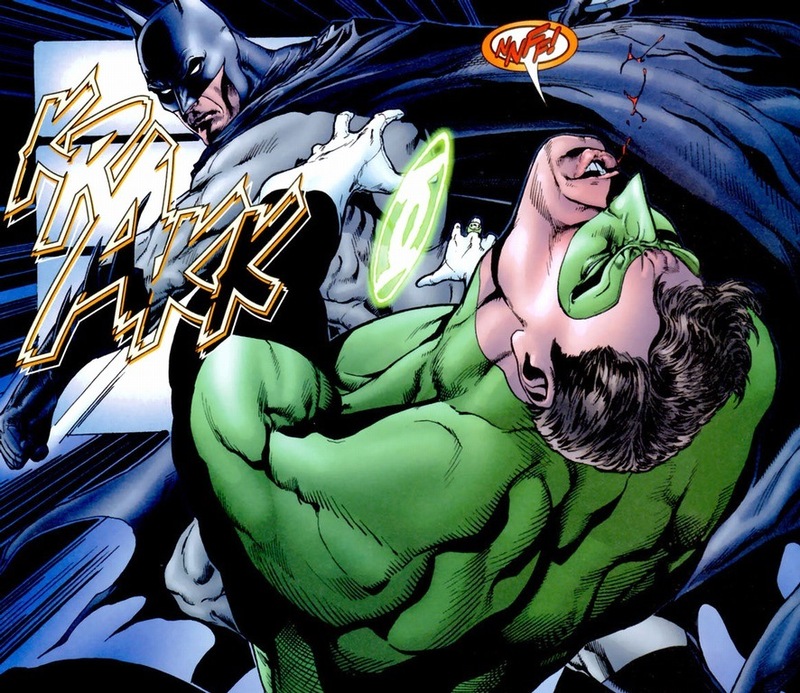 Not terribly surprising, as Batman and Green Lanterns have a long and lengthy history of sucker-punching each other. Having a bunch of abrasive personalities living in a moon space station together can create some friction. Like Batman’s rudeness. 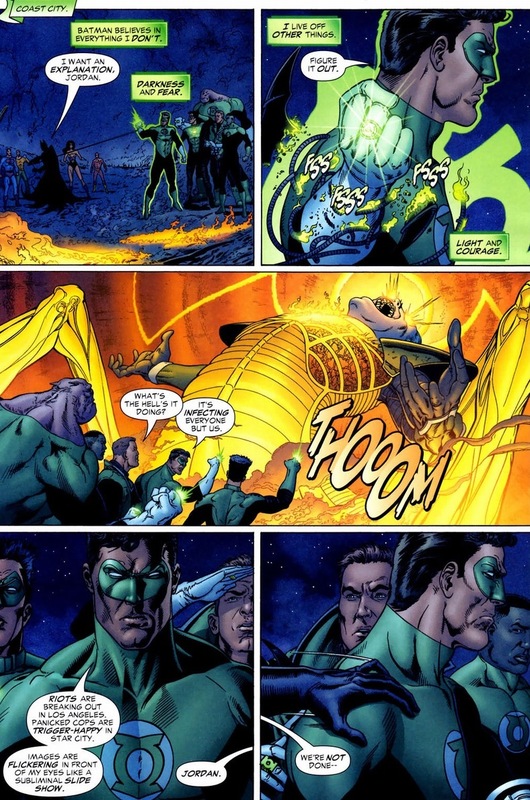 And Green Lantern’s also rudeness. But by the end of the issue, the two create at least some sort of status quo. 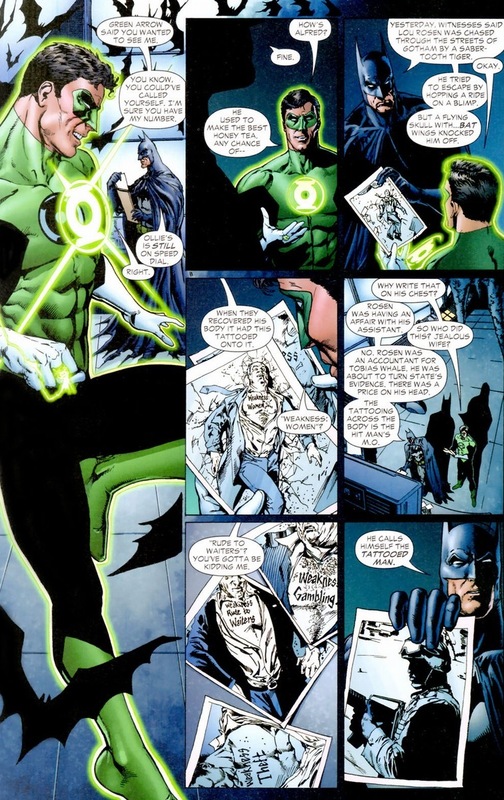 So, time for Jordan to fix some of those broken relationships, and Batman (probably both suspiciously and begrudgingly) gives our protagonist a chance to do so in Green Lantern #9, volume four, written by Johns and drawn by Van Sciver. 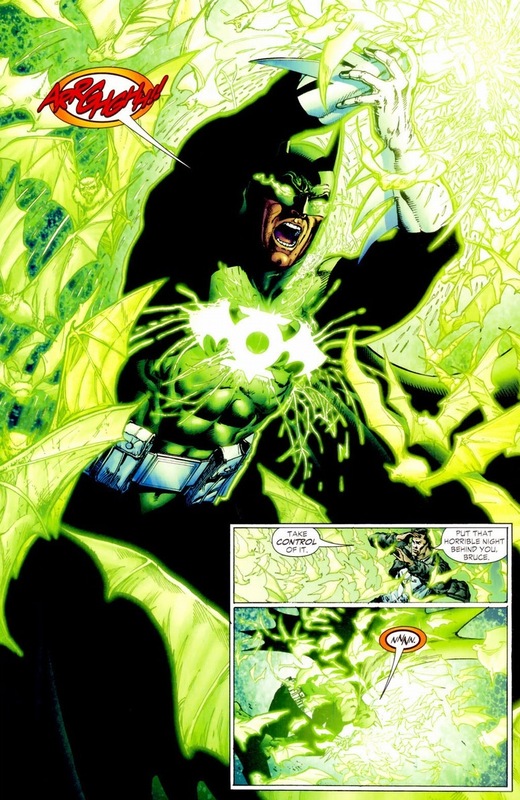 We all agree Green Lantern’s glow is less of an entrance and more just to annoy Batman, right? Bad habits die hard, especially when Jordan’s arrogance prevents him from not being a jerk. 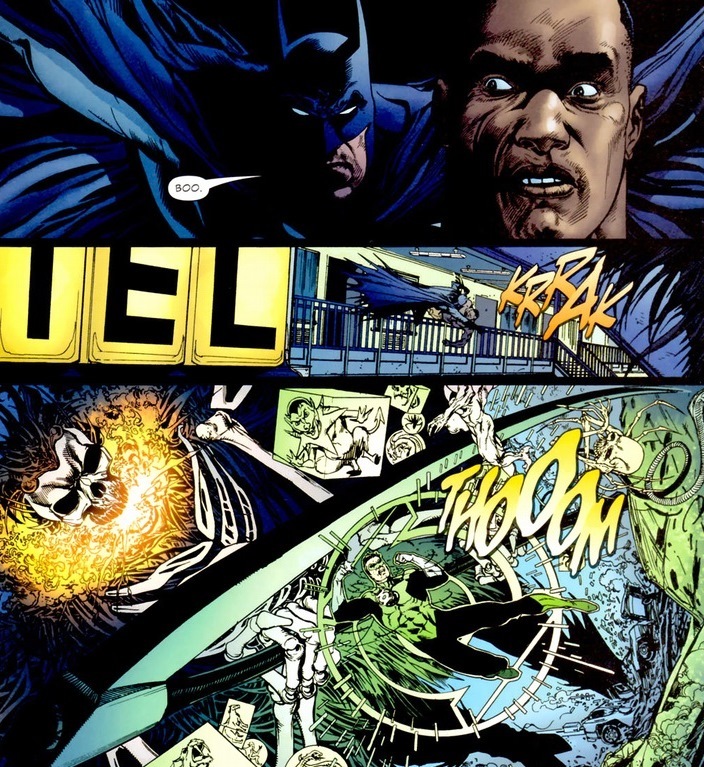 But before we judge, that’s his most endearing character trait — fearless around the scariest man in the Justice League. And while they may not be exactly friends at this point, the next pages pretty much sums up how Batman would talk to anyone — Superman, Wonder Woman, Robin, etc. You know what’s coming. Remember the last time you saw this panel a few pages up? Y’see, some superheroes tend to be more sucker-punchable than others. 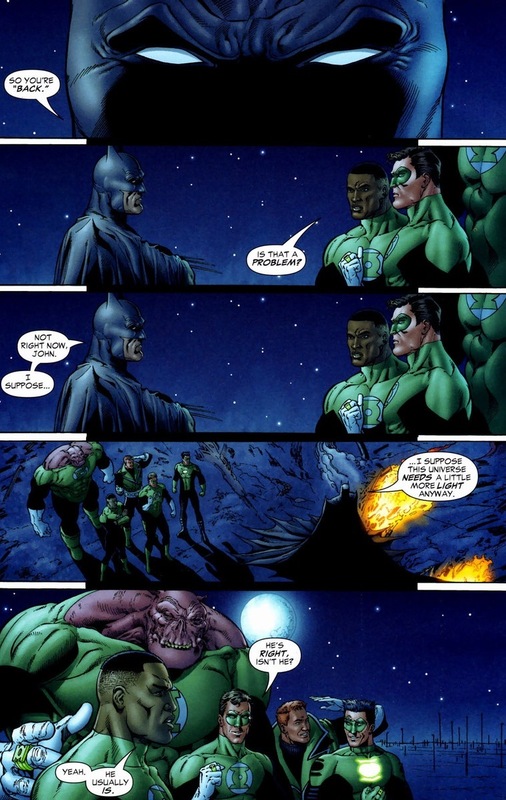 Without a warning, Green Lantern’s just a normal dude. Same with Batman. Though Superman still retains his brick wall face even when surprised. No one sucker punches Superman, but that’s probably because he’s more likable than his teammates. That and he can bench press planets. Anyway, the two head out to stop the Tattooed Man, which leads to some more wonderful bonding moments. 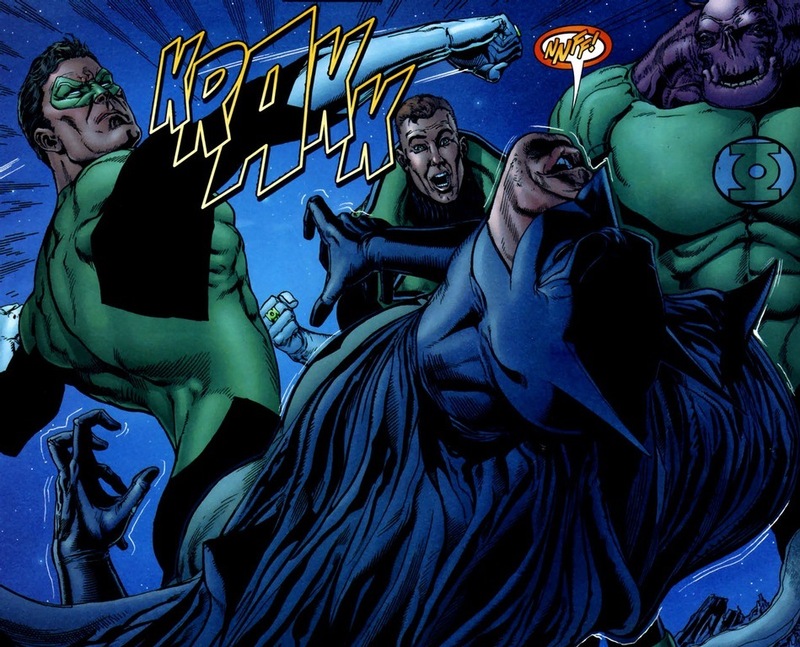 Essentially, and maybe as a penance, Batman uses Green Lantern to take the brunt of the Tattooed Man’s assault (any tattoos on his body come to life and attack his enemies — I’m serious). While cuts and bruises won’t make up for Jordan’s actions the decade before, at least it’ll allow Batman to do his best scary Batman routine. Cool art, right? As you imagine, they win. I mean, they may not always win, but if anyone gets to kill Green Lantern and Batman, it won’t be someone named the Tattooed Man. Alone and riding the high of a successful bad guy beat down, Jordan attempts his darndest to bond with the Dark Knight. Baby steps and whatnot. 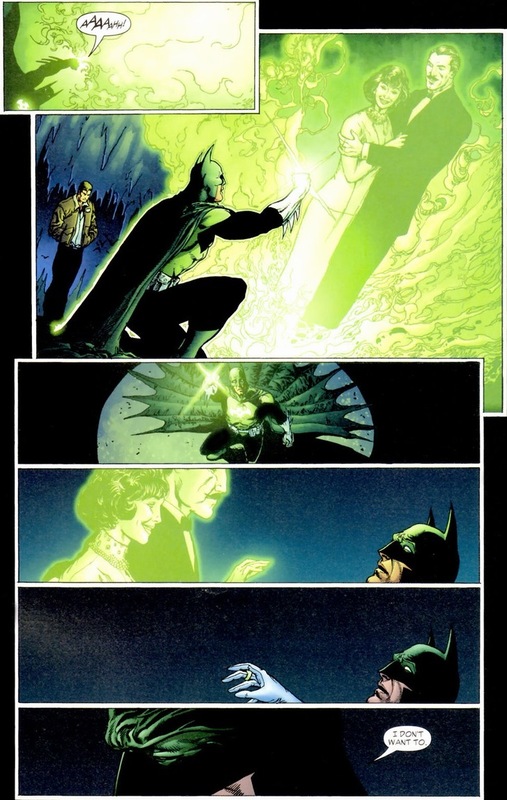 Yes, Batman rejects Green Lantern’s gift that might allow Bruce Wayne to confront and make peace over the death of his parents. 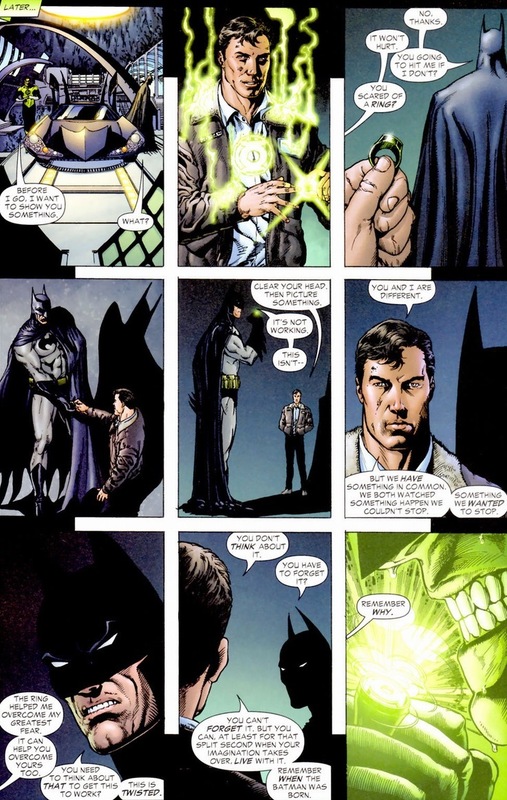 Certainly a lofty idea that probably can’t be solved with a single Green Lantern ring projection, but Batman’s refusal speaks more to the man than the ability of the ring. Batman’s lifelong mission to eradicate crime begins the moment his parents die — sparking the vengeance and dedication that continues to present day. 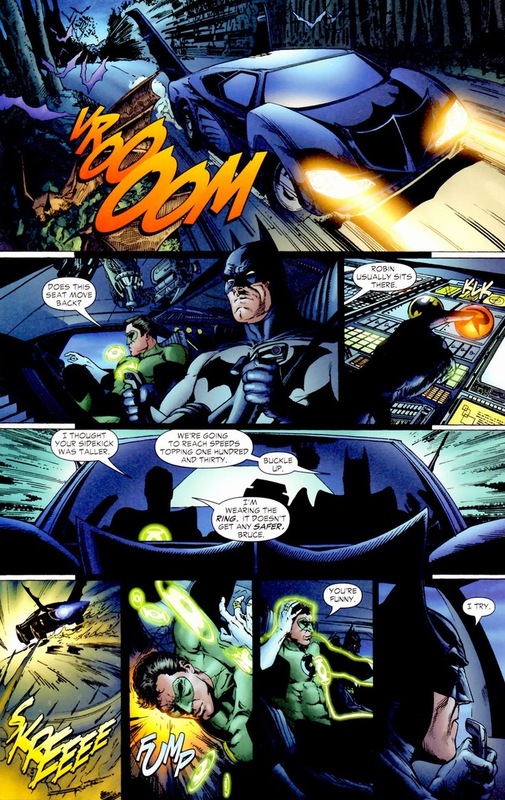 I assume by making peace with his most vital moment would only hinder his ability and mission, and thus that specific pain and torment is important for Batman’s drive, despite the emotional damage. 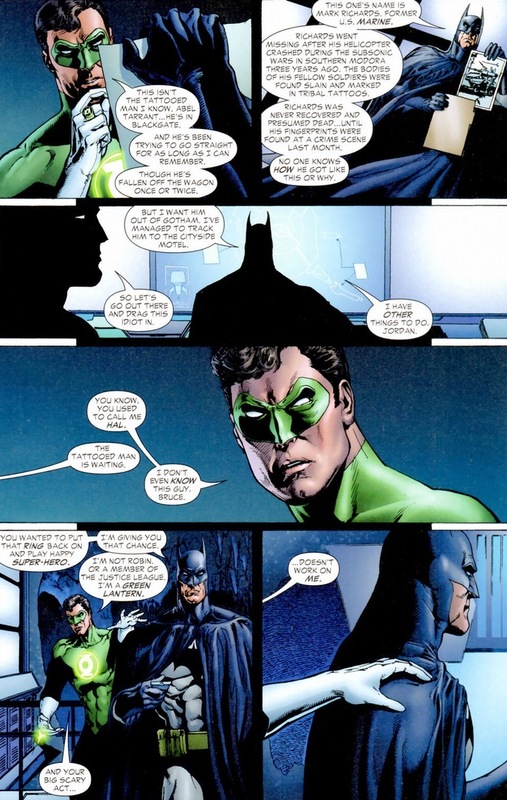 Or maybe Batman just doesn’t want Green Lantern to see him cry. 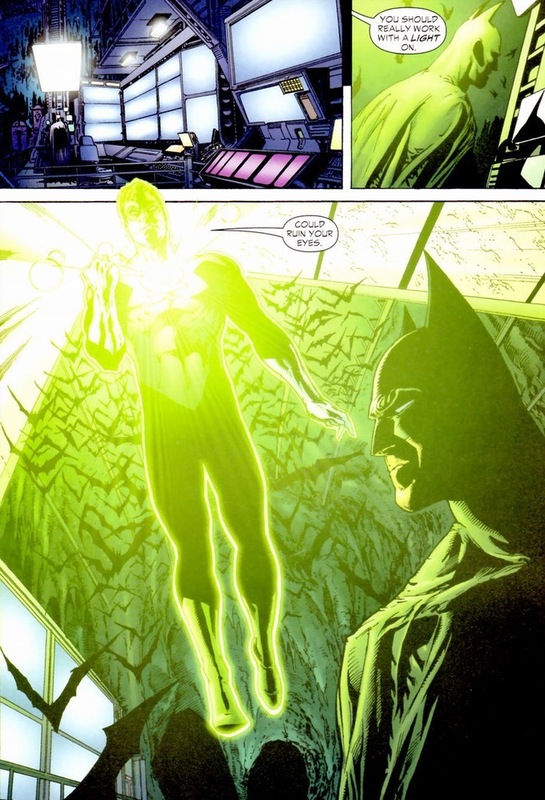 Most importantly, Batman can at least recognize that Green Lantern’s trying to mend their shattered friendship bridge. That always counts. More Green Lantern on Wednesday! I’m just as excited as you are! 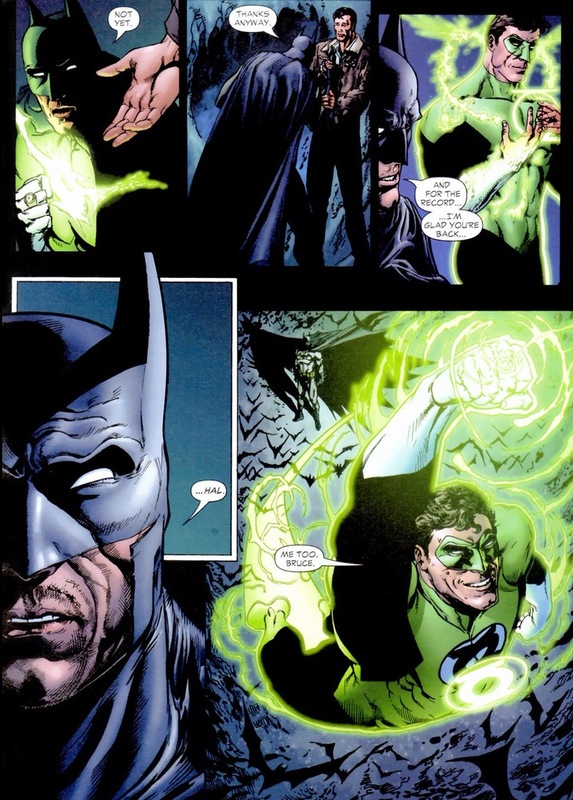 I thought the best post-Rebirth story to team up Batman and Hal Jordan was The Brave and the Bold (2007 series) #1, written by Mark Waid. 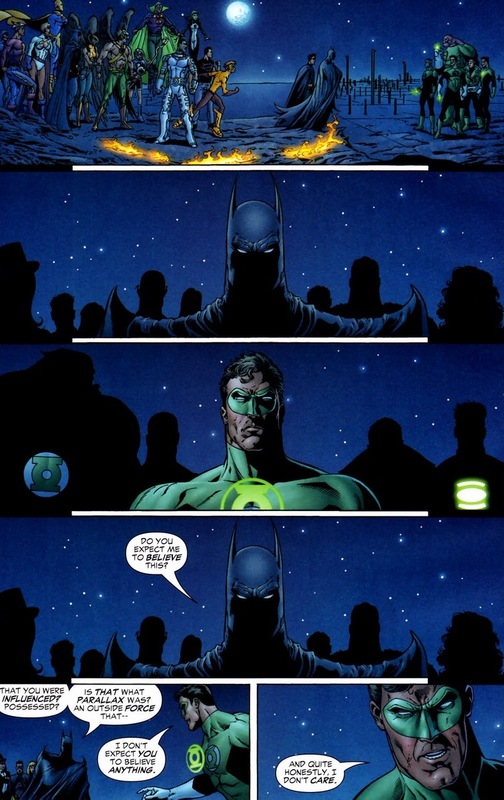 You see Batman and GL having this friendly rivalry, sort of trying to one-up each other, but it’s obvious that underneath that they each have tremendous respect for one another.